Papua New Guinea is located on the eastern half of the Island of New Guinea and is 160 kilometres north of Australia. The western half of the Island is Irian Jaya, a province of Indonesia. Papua New Guinea comprises both the mainland and some 600 offshore islands. It has a total land area of 462, 800 square kilometres and is about the same size as Thailand. The country is relatively young and its geography is diverse which is characterized by high mountain ranges, deep valleys and swift rivers in the interior and open plains, tropical forests and swampy inlets in the coast region. Located just south of the equator, Papua New Guinea experiences a moderte tropical climate with high levels of seasonal rainfall. In the highlands temperatures can range from a low of four degrees celsius to a high of 32 degress Celsius. Papua New Guinea has a population of over 4.4 million people (using 1997 projections by the National Statistical Office). The majority live in the highland valleys, many in isolated villages. Apart from the National Capital District (NCD), population density is relatively low. Around 15 per cent of the population lives in the major urban areas. The major city and capital of the country is Port Moresby with a population of about 271,813. Other large towns and cities inclue Lae (population 113,118), Madang (32,117), Wewak (25,143) and Goroka (17,269). maintains a strong influence over most of the population. Long before the concept of democracy was established in Europe, Papua New Guinea communities were reaching decisions by consensus and not by the dictates of the most powerful member of the village. this concept of democratic consensus in decision-making is evident in most aspects of today's society. The Papua New Guinean attitude to the land is also very different from many other countries. Land is not a commodity that can be bought and sold by individuals - it is a permanent and integral part of a village community. Land is owned and maintained by generations of clans. Although they cannot sell the land, individuals can hand over their own usage rights. About two-thirds of the population are Christians, Catholicism being the largest denomination in the country. Papua New Guinea gained independence in 1975. This followed several years of internal self-rule by a democratically-elected Chief Minister and Government. Universal adult suffrage is enjoyed by the population and there is freedom of the press and of speech. The National Government consists of three independent branches - the executive, the legislature and the judiciary. Executive power is vested in the National Executive Council (NEC) or Cabinet, which comprises the Prime Minister and usually about 27 Ministers. There are 19 provinces in Papua New Guinea as well as the National Capital District. The provincial governments have a similar constitutional arrangement tot he National Government and have concurrent power with the latter in areas such as agriculture, business development, town planning, forestry and natural resource. National laws, however take precedence over provincial laws if there is conflict. Papua New Guinea is an active member of the Commonwealth. The ceremonial Head of State is the Governor-General who, while elected by Parliament, represents the British monarch. Papua New Guinea is located in the South Pacific and lies 3 degrees north and 11 degrees south of the Equator. Papua New Guinea consists of a mainland and a collection of islands of varying sizes. The mainland is really part of the Island of New Guinea, the second largest island in the world after Greenland. The island as a whole has an area of 868,000 km, which the eastern 462,800 km is part of Papua New Guinea. Both geologically and topographically, the country is very new. It is situated in a zone where the earth's crust is very weak, on the boundary between two tectonic plates, those of the ancient continent of Australia and of the Pacific Ocean. It forms part of the so-called "Ring of Fire" around the edge of the Pacific; and most of the country has been formed by comparatively recent earth movements and volcanic activity. The Coasted and island regions tend to be hot and humid, with temperature ranges averaging between 68 and 89 degrees. Some areas in the South have a district rainy and dry season, such as Port Moresby while other coastal areas have a wet season (Madang and Morobe), but is not so clearly defined as in the South. Rainfall in such areas is high. For example, the city of Lae receives between 13 and 15 feet of rain per annum (390 to 450cms). The Highlands regions can be quite chilly at night although the days are usually warm and clear. A typical highlands cloud cycle takes place each day -- clear in in the morning with some local fogs followed by an increasing cloud buildup. Afternoon rains are common. The overall appearance of the country is extremely rugged, particularly in the highlands, which are characterized by sheer slopes, sharp ridges, fast-running rivers and the scars of innumerable landslides. The dominant feature of the country is the central spine, a complex of high mountain ranges intersected by alpine valleys and many plateaus. The mainland ranges from open beaches to coastal swamps and rough flood-like areas in Oro Province, to dry savannah country in the Markham and Ramu valleys, and the steep precipitous mountains of the Highlands region. Mt Wilheim is the highest mountain in Papua New Guinea and is about 15,000 ft (4000m). The interior of the island is very mountainous with fast flowing rivers and deep valleys. There are few large valleys in the Papuan region but the New Guinea region has several large open valleys such as the Asaro, the Jimi and Wahgi, provide excellent agricultural and pasture land. Offshore, there are many small islands, many without fresh water. Island provinces are located off the top of Papua with a cluster of islands forming the Milne Bay province, and to the north of the New Guinea mainland, the provinces of Manus, New Ireland, East New Britain, West New Britain and North Solomons (Bougainville). All island provinces are noted for their coral reefs, beaches, rich volcanic soil and abundance of marine resources. The islands of New Britain and Bougainville have active volcanoes and experience earthquakes of up to 5 on the Richter scale from time to time. 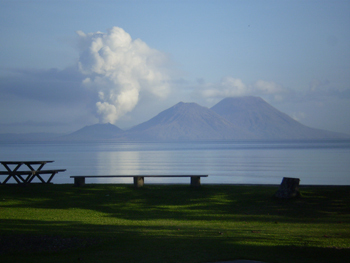 The Matupit or Volcano erupted recently on 19 September, 1994 and destroyed the township of Rabaul. Along the coast, the tropical weather dictates light, comfortable clothing. Umbrellas are more comfortable than raincoats. In the cooler regions, the days are warm so light clothing is recommended. In the highlands, a sweater or light jackets are recommended at night when the temperature drops. Most highlands' residents sleep under blankets all year round. Two distinct economies exist side-by-side in Papua New Guinea - the traditional and the cash economies. The traditional sector, mainly subsistence and semi-subsistence farming, supports abbout 85 per cent of the population. Most villages are self-sufficient and small surpluses of produce are available for trading. Papua New Guinea exports mainly minerals and agricultural commodities. The National Government encourages more production onshore for the needs of the population and for export. The economy is dominated by mineral petroleum projects. However, the agriculture, forestry, fishing and manufacturing sectors combines still account for a significant portion of the nation's gross domestic product. Total exports from Papua New Guinea are valued at more than $US2 billion, major exports being minerals (gold, silver, copper and crude oil), timber, coffee, palm oil, cocoa and copra. Papua New Guinea has experienced a relatively even balance of trade over the last five years, with exports marginally exceeding imports. Major imports consist of machinery and equipment, manufactured goods, processed food and chemicals. The late 198o's saw the Papua New Guinea economy experience a difficult period. The closure of the worlds largest copper mine, on Bougainville Island, was a significant set-back. That was compounded by reduced world prices for a variety of agricultural commodities central to the economy. The Government took corrective measures by reducing expenditure, devaluing the kina (the local currency), restricting wage increases and imposing restrained monetary policies. Those measures and the development of several new, large mineral and oil projects have laid the foundation for strong growth for future years. There are extensive reserves of natural gas and oil. The first oil production began in the Kutubu field, in the Southern Highlands, in mid-1992. A conservative estimate of recoverable reserves at this field has been put at around 270 million barrels. The Globe Oil Project, currently under construction in the Gulf and Southern Highlands Provinces, is scheduled to commence commercial oil production in late 1997 / early 1998 at a rate of 50,000 barrels of oil per day. Other known fields are yet to be developed. The main mineral deposits are copper and gold but there are also recoverable deposits of other minerals. The OK Tedi mine, in the Western Province, is now a major producer of copper and gold. The Porgera gold mine in the Enga Province is one of the largest in the world and is expected to produce 11.3 million ounces of gold over its 20 year life. The Lihir project is New Ireland Province is estimated to have 13 million ounces of gold which will be mined over a 30 year period. The Misima gold mine in the Milne Bay Province commenced operations in 1989 and is producing an average of over 300,000 ounces of gold per year. The waters around Papua New Guinea contain large stocks of marine resources. Within the 200 mile economic zone are large varieties of fish, including migrating schools of tuna. Forest products are one of Papua New Guinea's major exports. There are 36 million hectares of enclosed forest of which about 15 million hectares of high quality tropical hardwoods are considered to be suitable for development. The Government is mindful of its obligations to environmental heritage when promoting the forest resource. Each major investment project is carefully evaluated in terms of its environment impact and every effort is made to develop appropriate guidelines to meet the needs of the local people and the Investors. Papua New Guineas enormous and largely untapped natural resources offer excellent investment opportunities. Coupled with the Government's positive attitude to foreign investment through the granting of incentives and concessions, and the recognition of the private sector's important contribution to the economic growth, it is clear why many international companies have invested in Papua New Guinea. The security of investment in Papua New Guinea has always been granted the highest priority by the Government. The Government is fully aware of the perception investors have about risks they take when investing in Papua New Guinea. It has made an undertaking to minimise the perceived risks (including expropriation, repudiation of contracts and discrimination) through the granting of the most favored nation treatment to investors as if they were nationals of Papua New Guinea. Papua New Guinea's membership fo the World Bank's Multilateral Investment Guarantee Agency (MIGA) in 1990 also demonstrates the Government's commitment to ensuring that if nationalisation did occur for the national good, the investor concerned would be adequately compensated. The establishment of the Investment Promotion Authority in 1992 through the Investment Promotion Act (the Act) was done so in recognition of the comfort that investors look for when considering Papua New Guinea as an investment destination. The Act has provided for such matters under Section 37 which protects against expropriation, cancellation of contracts and discrimination through the application of the most favoured national treatment to investors. The globalisation of trade and investment has advocated a lot of the above principles which Papua New Guinea has implemented in its domestic legislation as well as by adopting those principles when it became a member of MIGA. This international practice demonstrates Papua New Guinea's seriousness in fair play and protecting investors and their investment in the country. The four mines in Papua New Guinea and the alluvial miners produced 68 tonnes of gold in 2003 and minerals made up 49.4% of the country's export revenue. Production in 2005 is estimated to be over 65 tonnes. Papua New Guinea boasts three out of the six top producing gold mines in Australasia. The relation between geological aspects, high prospectivity / large occurrences / ease of discovery, and commercial aspects, high capital / operating costs, are the main reasons why the mines are large. Smaller, higher grade mines will be part of the industry's future. Many international companies from Australia, South Africa, Canada and the USA are engaged in the country's mining and exploration activities. Recently, the Chinese company, "China Metallurgical Construction Company" (CMCC) has begun to show interest investing in PNG and has signed investment agreements with the PNG Government, especially in nickel and cobalt in the Madang Province of PNG. This appears to be a new initiative by the Government to lure investments from other countries apart from its traditional investors who are still a part of the PNG economy which also compliments the Governments "export driven economic strategy" policy. Just in a nutshell, the following projects give an impression of what is currently going on in Papua New Guinea. The OK Tedi has produced, after 20 years of mining, 2.875 million tonnes of copper, 7.136 million ounces of gold and 15.599 million ounces of silver. It still has reserves for about 10 more years of production. Gold production at Porgera exceeded 1 million ounces in 2004 and has a projected operation life of another 9 years based on currently known reserves. At Lihir, 2004 production amounted to a little over 600,000 ounces of gold. 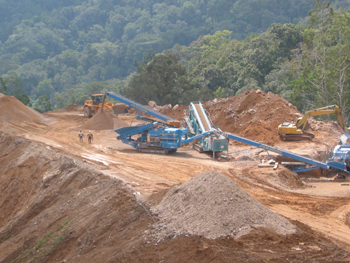 The Tolukuma is maintaining gold production at over 7,000 ounces per month. Commencing production in 2006 is the Kainantu underground gold mine. Mine life is expected to be about 6 years with good potential to extend this. Also in construction is the Simberi with production of between 35,000 and 50,000 ounces per year to produce its first gold production in October 2007. The Hidden Valley has commenced construction to mine the Hamata resource. Working to come to production in the years beyond 2005 is the Wafi gold prospect which, after the pre-feasibility stage, could production in 2008. New Guinea Gold Corporation which will bring three smaller gold mines into production over the next two to three years of which Sinivit has commencd producingin 2007. Others planned include, the Golpu copper project, the Ramu nickel project and the Frieda copper porphyry project. The major representative of the Canadian involvement in Papua New Guinea's mining scene is major Placer Dome Inc., which has had a presence in Papua New Guinea since the 1920s. Placer Dome's 75% share of the Porgera mine added nearly 750,000 ounces of gold to the company's account in 2004 after depletion of reserves. Porgera (75% owned): The Porgera mine, located in the Enga Province n the highlands of Papua New Guinea, is often considered one of the world's great gold mining operations. In 2004, Porgera was the largest contributor to Placer Dome's gold production and it is estimated that it will add another 350,000 ounces of gold in 2007. Not so long ago, Placer appeared determined to pull out of Papua New Guinea, Now it is pointing that Porgera mine could still be mining new underground ore bodies well after the earlier proposed min closure in 2012. It has taken a leap into exploration of the ocean floor in the Bismarck sea, in a joint venture with a junior, Nautilus Mining. Company executives have suggested that with a bit of luck, Papua New Guinea could become the first country in the world to successfully mine mineral deposits on the ocean floor. Placer Dome also deserves credits for being the perfect example of how a major mining operator handles its responsibility to the environment. After acquiring an interest in 1977, it has been producing more than 3.6 million ounces of gold and 18.3 million ounces of silver at its Misima Mine between 1989 and 2004. The mining order from the open pit was terminated in mid 2001 after which the production continued from stockpiled ore until early 2004. As Placer Dome states "Progressive rehabilitation of mines areas has been an ongoing aspect of the mining operation. The company's commitment to leave behind a better future has earned plaudits from local landowners, government officials and other stakeholders. Misima will continue to operate at the forefront of recognised best practices for environmental achievement and community development." That these are not only words, may be seen from the photographs below, which show the Misima mine open pit in August 1997 and again in October 2003 after the re-vegetation. Recently, the Government made a decision to establish the Mineral Resources Authority (MRA) with the view to strengthening the investment, management and co-ordination for the Mining Industry sector. This is significantly important for the Government where management of royalties for the people of the project area are concerned. For the first time in the National's history, there will be mix of small, medium and large projects being undertaken during the next five years. The overall scenario suggests that Papua New Guinea is on the threshold of a new mining boom different to past booms fuelled by the various single project developments throughout the country. This general information on Papua New Guinea has been prepared to provide a context for the specific information on a Member Company of the European Gold Centre: New Guinea Gold Corporation.